My plan for the day was a simple one, to ride from Kremmling to Walden then to drop off-route and ride down the Poudre Canyon to the city of Fort Collins where I will be taking a short break from my adventure. Since there would be no opportunities for food or water in the 60 miles from Kremmling to Walden, I made sure to have a big breakfast and to fill all my water before hitting the trail. The day begin with a climb of around 1,400 feet over Muddy Pass and then a long slow descent of 700 feet down into Walden. I probably should have stopped in Walden for a meal before traveling on, but knowing that I was so close to Fort Collins encouraged me to keep pressing forward so I passed through town without even taking a foot off my pedals. Although I had driven from Fort Collins to Walden before, my memory of the road was fuzzy. But based on what I recalled, and based on information from other cyclists, I thought it would be a primarily downhill ride. This impression was wrong. 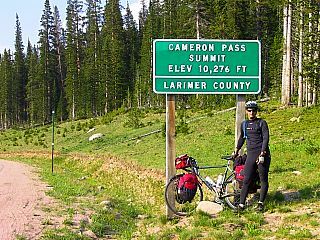 Even though Fort Collins lies 3,000 feet below Walden, I had completely forgotten that I had to get over Cameron Pass before riding down the Poudre Canyon. This meant I had a 2,200-foot climb ahead of me that I wasn't even aware of. As I rode closer and closer to the mountains I kept wondering how I was going to get over them, when suddenly memory of Cameron Pass hit me. Had this recollection come earlier in the day I probably would have stopped for the night in Walden, but at this point I was committed. 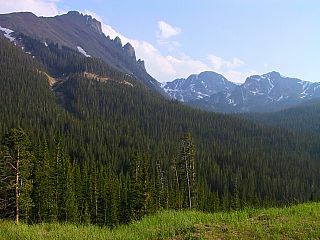 Fortunately, the grade to the summit was gradual and although it took time to climb it wasn't too intense of an effort. After cresting the pass I was treated to the pleasure of a 5,000-foot descent stretched over 60 miles through the Poudre Canyon into Fort Collins. The Canyon is a simply beautiful stretch of terrain, and it was a wonderful way to spend my last day riding before taking a break from the road. I reached the outskirts of town just after sunset and called good old Joe and Heather for a ride. Despite climbing over two mountain passes today I ended up setting a new personal record for daily miles, at just over the century and a half mark. Now that I'm in Fort Collins I will be taking some time off before I climb back on the saddle. It is a good place for me to stop for rest, repairs, and restocking of supplies before going any further. Starting on the 27th I'll be spending five days in Reno for my close friend Sean's wedding, then I will return to Colorado and my bike. Expect to see me riding again between the 3rd and the 5th, and this will be my final update until that time. I'm curious as to what gear you decided to get rid of and do without. Also, did you maintain your body weight, or lose lbs.? Look forward to seeing in Reno. I truly enjoy following your journey. I am keeping your Grandma Berta and Jim posted on your progress. Glad to hear you're taking a few days to rest and visit with your friends. I enjoyed talking to your Mom - finding out about your trip. Take care. What a pity you sailed through Walden.. one of my favorite little CO towns. Hardly impacted by tourists at all and just full of local hospitality. When you climb back on your saddle, please remember that the essence is in the journey... or in cliche form "remember to smell the roses! I`ve just entered comments - most envious of your trip - don`t know what happened to them - thanks for sharing your adventure with the rest of us .